Each year around the holidays, we put out a list of What to Buy a Geek for the Holidays, based on suggestions from enterprise data storage industry analysts and users about what gadgetry will make their Yuletide bright. No sooner has your credit rating recovered from the holiday adventure, though, than another gift-giving occasion comes along that may require a whole new round of anxious searching. Obviously, our What to Buy a Geek lists are also an appropriate resource for Valentine’s Day ideas. This blogger turned up some other great finds — my personal favorite is the 8-bit Dynamic Life T-Shirt. 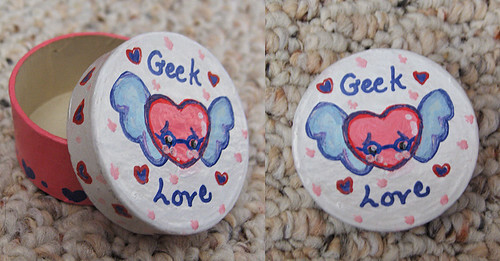 ThinkGeek, a geek-gift favorite, has a whole Valentine’s day section, as does NewEgg. Personally, I’m partial to the ThinkGeek mini business-card filing cabinet and the portable photo studio, though they are admittedly not among the most romantic items available. If your geek is a Rubik’s cube master or just enjoys a challenge to go along with their gift, why not give them the Magic IQ gift box? Among the most coveted storage-specific geek items I’ve seen in the last year or so is Mozy’s “Back the F:/ Up” T-shirt. The good news is that it’s available…the bad news is that it’s not for sale. But rest assured, if you get your hands on one of these on behalf of your geek, it will be appreciated. If none of that is unique enough, we also had an unusual pitch cross our Outlook inboxes here at Storage Soup in the last week, subject line: “For Techie with Love on Valentine’s Day.” The event: a Valentine’s Day auction of rare books taking place in Los Angeles and San Francisco. An early edition of Planning and Coding of Problems for an Electronic Computing Instrument, Part II, Vol I, .a volume on “Mathematical and Logical aspects of an Electronic Computing machine” by Herman Goldstine and John Van Neuman (est. $500 – 700); an assortment of early internal IBM publications and offprints – “704 Training Manual,” with “704 Problems” (est. $800 – 1,200); a collection of mimeographed manuscripts and lecture notes from the 1950s, documenting the early years of computer instruction at the university and industrial level (est. $1,000 – 1,500) and an assortment of early manuscripts and printings relating to the development of Fortran and other forms of programming as well as a selection of printed broadsides and handouts issued by Remington Rand and covering the Univac and Ferractor systems (est. $300 – 500).